On Tuesday, May 10th, Lomo’s representative attended the 3rd District Police Advisory Council (PDAC) monthly meeting with Capt. Millilo. The PDAC advises the Capt. on public safety and other quality of life issues in the District. The Capt reports to the PDAC on ongoing crime prevention and other initiatives undertaken by the police. The topics discussed at this month’s meeting were the upcoming Community Day. 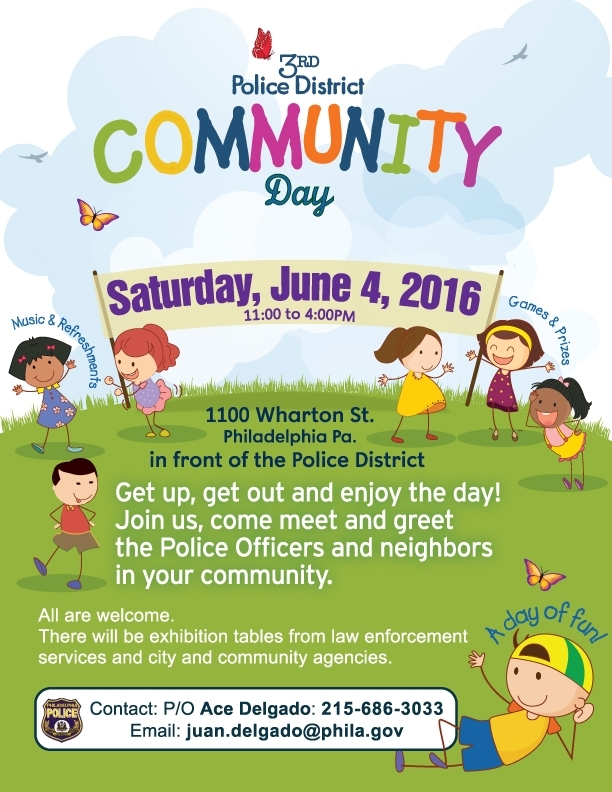 This event will be held on Saturday June 4th from 11 AM to 4 PM outside the 3rd police district at 11th & Wharton. A flyer for this event has previously been posted on LoMo social media. There will be activities for children, free hot dogs, soda, water, water ice, etc. It’s a great opportunity to meet the local police as well as other residents in the 3rd District. The other topic discussed was impending traffic disruptions in South Philadelphia for the upcoming Democratic National Convention at the end of July. All information is preliminary and will likely change several times before the event. The Convention has been designated a National Security Event and the US Secret Service is the lead agency. The Democratic National Committee (DNC) is organizing the event and is the agency driving most of the decisions. The current plan is to close all streets to traffic, with the exception of residents,from 7th to 20th Streets, Packer Ave to the Navy Yard. Marconi Plaza has been designated the “free speech” area where demonstrations, if any, will be allowed. Again, this is very preliminary information and is subject to change. LoMo residents desiring to bring information or complaints directly to the District Capt. can email LoMo with the phrase PDAC in the subject line.